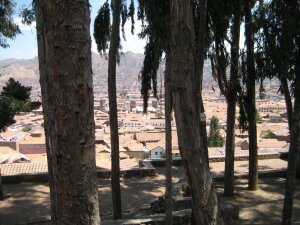 I visit Cusco in Peru, and see some of the ruins in the nearby areas. 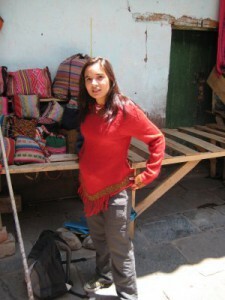 Embarking on a trip to walk the Inca Trail to Machu Picchu, part of my trip takes me from Lima to Cusco. 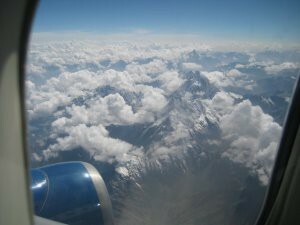 The flight takes us over the Andes’, and as advised by our guide, we all get seats on the left hand side. I find myself sat next to a newlywed Japanese couple, who cant keep there hands of each other. The pictures of the mountains bellow were spectacular. We arrive at the airport and are picked up by our driver and local guide, Wilfredo. 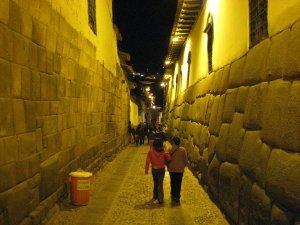 Cusco was the capital of the Inca Empire, and means literally navel or center, to signify it as the center of the Empire. All the traffic police seemed to be women in thigh length boots !. Our hotel had a beautiful courtyard where I sat with a bottle of coke. 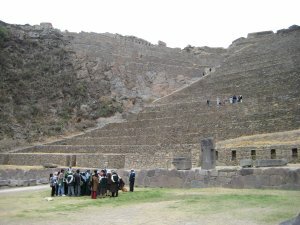 Coricancha or temple of the sun was built during the reign of the Inca Pachacutec to honour Tawantinsuyos’ most important divinity and served as astronomical observatory . 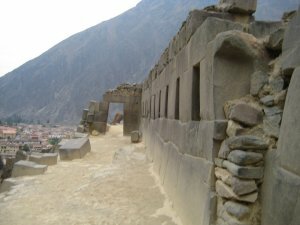 At the summer solstice, sunlight reflected into a niche in the wall where only the Inca were permitted to sit. The walls floors and alters were originally covered with gold. 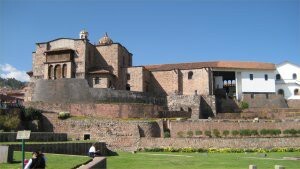 Much of the wealth was removed to pay ransom for the captive Inca ruler Atahualpa at the time of the Spanish conquest. 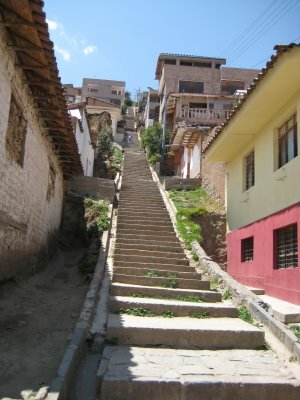 Atahualpa was later murdered and Francisco Pizarro awarded the site to his brother Juan. Upon Juan’s death, the structure passed to the Dominicans, who began to construct the church of Santo Domingo, using stones from the temple. Many of the pictures show woman in skirts, which resemble high mountains (the people were forced to pretend to convert to Catholicism, but secretly held on to there own religion). An ingenious restoration to recover both buildings after the 1953 earthquake lets you see how the church was built on and around the walls and chambers of the temple. 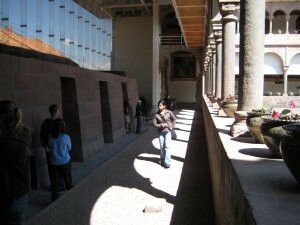 On the left, the walls of an Inca Temple, on the right, the wall of a Roman Catholic Church. The Cathedral dominates the north-east side of the Plaza de Armas (main square) and sits directly over the foundations of the Inca Viracocha’s palace. 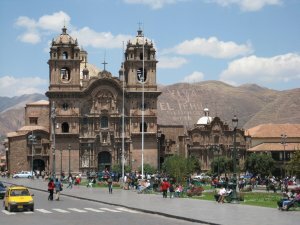 The Cathedral took 100 years to construct and inside there is an amazing Basilica, and more than 400 paintings. 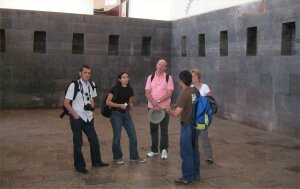 One of the paintings is of the Last Supper by Marcos Zapata showing Christ and the Apostles about to dine on guinea-pig, washed down with a glass of chicha!. 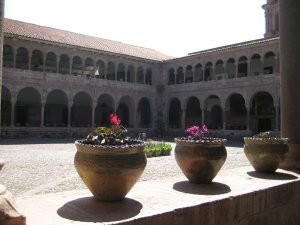 It was one of my favourite sight’s in Cusco, but you weren’t allowed to take photo’s inside, which was disappointing. 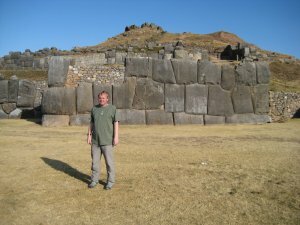 We didn’t spend very much time at Sacsayhuamán, probably the most known tourist sight in Cusco. 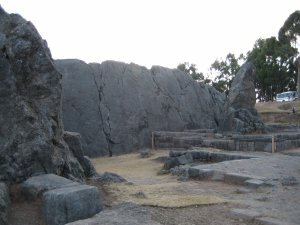 The whole area was made of large walls (they only go up so high, as the top rocks were removed by the Spaniards for building). 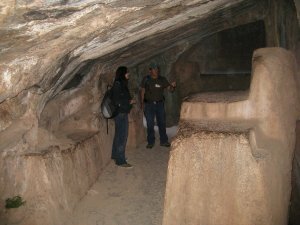 It is noted for an extensive system of underground passages known as chincanas which connect the fortress to other Inca ruins within Cusco. Several people have died after becoming lost while seeking a supposed treasure buried along the passages. 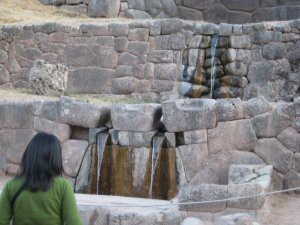 This has led the city of Cusco to block off the main entrance to the chincanas in Sacsayhuamán. Still in Sacsayhuamán we were asked to look closely at this rock, which apparently resembled a Condor or Llama or something. We visit another site called Qenqo. Until 1934, the whole are was covered beneath 3 meters of earth. 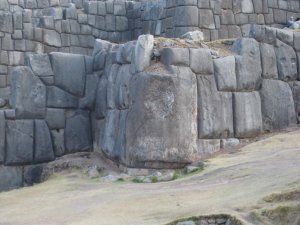 On the right is the Condor monolith stone which in ancient times cast the shadow of a Condor onto the rocks behind it. We head underground, and see this amazing chamber. In the middle is a carved stone emplacement, which is either a throne or alter. 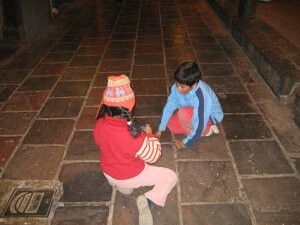 Some children were around selling mint leaves. I bought some (saved me picking it myself) and it really did clear my nostrils. 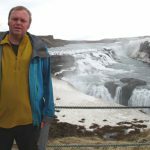 I was still suffering with AMS at this point, and at times appeared to stagger around, to the amusement of the other people on the trip. I tried and tried, but I couldn’t get a clear shot of the fountain, without someone in it. One the way back, I bought a warm hat for the trip from some stall holders. 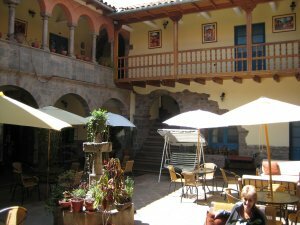 An interesting thing about Cusco, is that traders near to tourist sites, are actually cheaper than shops in the main square. This is the opposite of my experience in most tourist places around the world. I also bought a meditation blanket, which Ash found hilarious. Back to our hotel, for a quick shower and a rest, and then out for the evening. 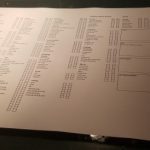 We visit a nearby Irish bar, Dan quickly becomes a regular as we discuss professional ethics (“would you write the software for landmine’s, for 10 times your salary” etc). 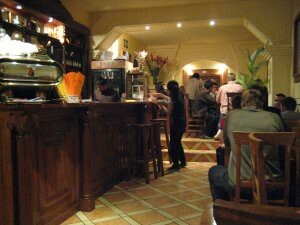 Later we wander around the square, and visit a pretty good pub, called the Cross Keys. Only problem is, they didn’t do food, and we were hungry. 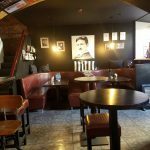 We find a “Restaurant” offering Steak and Chips for around a fiver and sit down. A decision I am happy to forget. The following day was free time. In reality, we were at 3400m and the main thing was just to get used to the altitude and acclimatize. 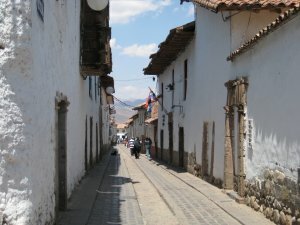 Many people who do similar trips, visit Colca Canyon and go white water rafting. This was a much shorter trip. I wander around the square a couple of times, and to be honest, wonder what I am going to do with the rest of the day. 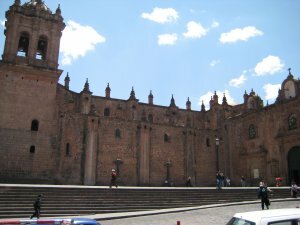 In the main square, in addition to the Cathedral was the Campania de Jesus. 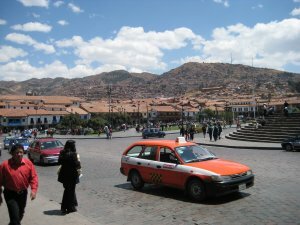 If you look to the right of the Church, you can see messages, “drawn” into the hills around Cusco (Cusco is completely circled by hills and mountains). 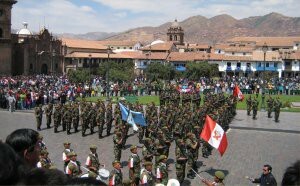 The Plaza de Armas or main square. 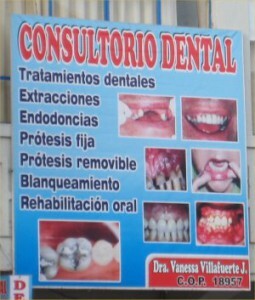 In ancient times it was called Huacaypata. Some say this means “The Warriors Square” others that it means “The Place of Tears” or “Weeping Square”. Anyway, there were plenty of latter day warriors out that day, celebrating something. Not sure what, but a video here, shows what it was like. Just in the nick of time, I run into the girls, and we have some breakfast/11’s’s at a cafe overlooking the square. Having hooked up with the girls, we decide to continue exploring. 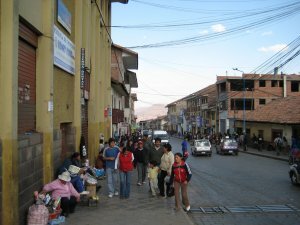 We head out of the square, and through the back streets and squares, to the place referred to by the locals as “up the hill”. Although the City is created on the ground in the shape of a Puma, its contours are more of a stadium or bowl shape. I guess somebody has to walk up these stairs, each evening after work. I am glad its not me !. I found a small park, and photographed the Town and buildings bellow through the tree’s. 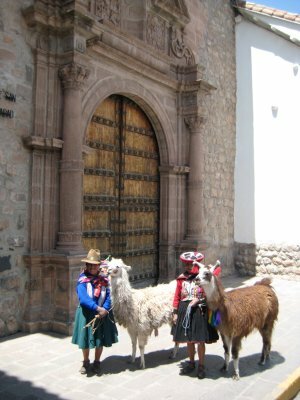 These 2 fine ladies pose in traditional dress with Llamas. They only wanted about 50p, to be photographed and I thought it was well worth it. Back at ground level, we wander out of the square to the place where the local villagers live etc. A bit more modest than the touristy area. I had seen a sign like this before in Nepal. Some of the marketing techniques, used by local dentists, really are rather sinister. In the end though, I was walking around with girls, and it wasn’t going to be long before we visited some kind of shop. 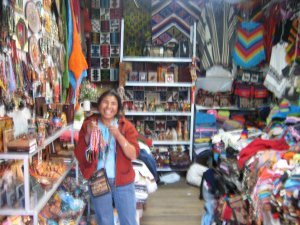 Between us, we bought most of the shop, from this friendly and helpful woman. Ashima tries on this Alpaca wool jumper. That isn’t a twinkle in her eye, she is wearing a money belt. 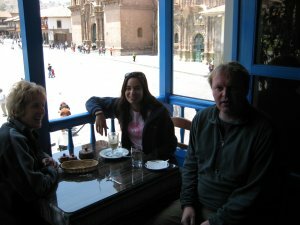 Although our guide didn’t know much about the town/nightlife around Cusco, my friend Amanda had been there 6 weeks before, and had all the inside info (she had actually been staying in the same hotel as we were). We wander down this alleyway (which I was able to photograph, as my new camera has adjustable shutter speeds). Amanda had recommended Jacks, “up the hill”. Everyone came with me, and we had dinner there. I really liked the place, and wished I could have visited it again. There was another restaurant called Fallen Angel, that I really wish I had visited. The following day, we drive out, and visit Olantay tambo. Right next to the modern town, that sells walking sticks and Mars bars, is the site of this ancient ruin. 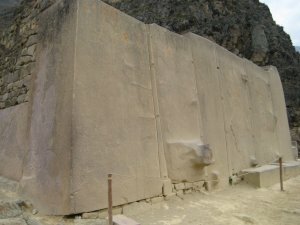 The shape is said to resemble a llama. It was my first sight of classical Inca terraces (apart from a scene in Halo 2). They are used for farming. Like many of the other ruins in the area, the enormous rocks, are so well carved, that its impossible to slide a piece of paper in between the joins. 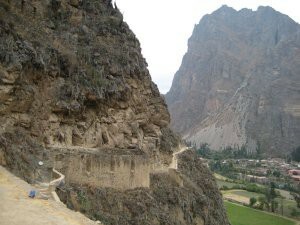 The stone used to build this temple came from high up a mountain on the other side of the Urubambo river. It would be a feat just to move this rock, let alone, carve and position it to withstand earthquakes. The mountain in the background, contains a sort of warehouse carved into the rocks, Petra style. Apparently the temperature and humidity there are perfect for storing grain.